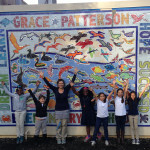 The front page local newspaper story, in the Vallejo Times Herald, about the school mosaic mural. The designs i printed out for the project were laid out on my workshop floor to figure out how the whole design would work and be able to hold so many individual mosaics (we ended up with 75 animal mosaics). 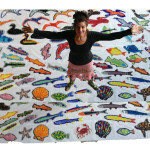 i picked a marine animals theme for the mural to resonate with the existing painted mural art at the school. i chose creatures that are native to this area, in the San Francisco Bay and the Napa River, both swimmers and flying animals. The mermaid seahorses, and flying fish were necessary to add Magic, of course. 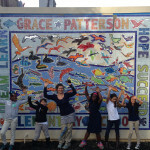 The design paper prints were used as a guide for piecing the mosaics when i (and four volunteer helpers of my own) facilitated the mosaic making event for the 60+ families that participated in piecing the mosaics. We had at least 140 people there in one large auditorium because each student had to be there with at least one adult family member. 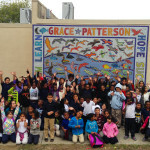 We had many families show up with 3 or 4 family members collaborating on piecing their small animal design that would eventually fit into the overall design for the mural. For the 2014 Vallejo Open Studios I hosted an actual open studio and invited the public to help piece the words for the mosaic mural border. 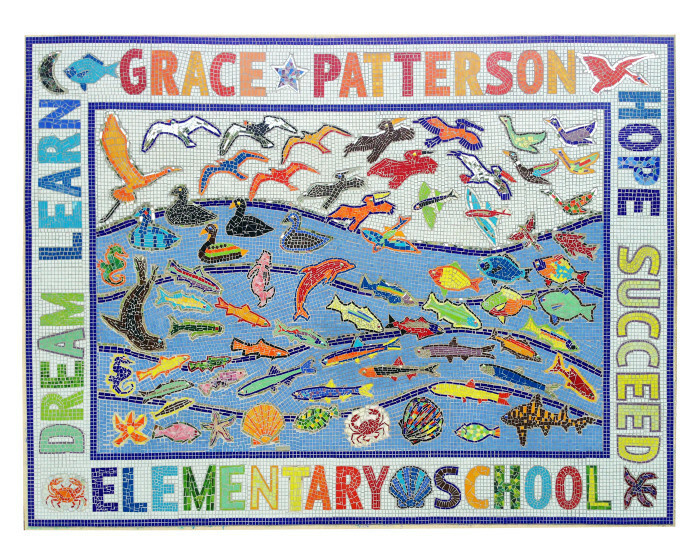 We produced 72 square feet of border mosaic for the Grace Patterson elementary school mosaic mural. Whew! What a day! 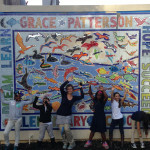 More photos of the completed mural.